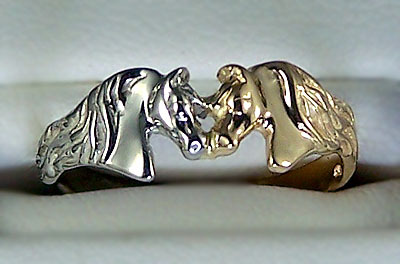 Show your love for these kissing Horse Heads in a ring. Enjoy this design pictured in 14kt white and 14kt yellow gold creating a wonderful two toned finish. Kissing Horse Head ring featuring flowing manes that wrap around to create the shank. A very popular design sure to bring you joy time and time again. Dimensions: 7mm wide at the top of the shank tapering down to 3mm wide at the bottm of shank. Pictured in 14kt white and 14kt yellow gold. Request your size in the comments box below!